Obi-Wan? Never heard of him. I’m in hiding. These are totally not Jedi robes. I love the Star Wars universe. I was four years old when my dad took me to see Star Wars; over the next couple of years (yes, for those of you too young to remember, Star Wars was in theaters from May of 1977 through November of 1978, and this is before the age of multiplexes) we saw it a dozen or more times, between the Empire Theater, the Oak Park theater, and the local drive-in. I lived for Star Wars, for Empire, for Jedi (my brother and I made up a song for Revenge of the Jedi, before the pre-release name change). It is very safe to say no single bit of popular culture has had more influence on me. As long as I can remember, all I wanted was to be an X-Wing pilot, a Jedi Knight, a fighter for the Rebel Alliance. Star Wars is in my blood, and I am all-in for the Light Side. Backstory accomplished, I want to talk about about a problem with the Star Wars universe. It’s a problem I’ve thought about a lot over the years. It’s a problem that really started for me during the Prequels (of course), but was actually first presented in Return of the Jedi, and has grown through the marvelous Clone Wars animated series, and into The Force Awakens. It’s never kept me awake at night, but I have dreamed about it an alarming number of times. Jedi robes are silly and wrong. On Tatooine, in that original film, Obi-Wan Kenobi is in hiding. He’s been in hiding for nineteen years from the forces of the Empire, who, with Vader’s help, have been hunting and killing all the remaining Jedi who managed to escape the Clone Wars and Order 66. Why would Obi-Wan continue to wear his Jedi robes on a daily basis? Even on Tatooine, on the planet farthest from the bright center of the galaxy, he’d want to stay hidden, to blend in. He’s got an important mission: protect young Luke Skywalker. I offer, in that first movie, he’s not wearing Jedi robes. He’s wearing local Tatooine garb. His robes are a bit more formal than Owen Lars’ clothing, but of similar cut and materials. Luke himself wears a youthful variation of the same clothes. Beru’s clothes, while a more feminine cut, are not far off. It makes far more sense to assume that Obi-Wan would adopt the fashion of the planet on which he’s hiding out than that he just continues to wear his formal Jedi robes, even while on the run from the Empire. This is further reinforced by the choice for Luke’s Jedi garb in Return of the Jedi. While he does sport a large robe early on, it’s black, and the clothes underneath are slim-cut black, with very short dark grey/black tabards and an obi. By the time he’s captured on Endor and delivered to Vader, the tabard and obi are gone, and he’s just in that slim, black, miltary-looking outfit. The black uniform and tabard/obi combination is very much like what Vader himself wears (minus the armor and life-support apparatus). It seems much more likely that this was the uniform of the Jedi — simple fitted black uniform, with tabard/obi and robe in ceremonial settings. Between ESB and RotJ, Luke has been studying and practicing not only what Master Yoda taught him, but also what he found in Obi-Wan’s journals back on Tatooine, journals left for him to find so that he could train to be a Jedi if Obi-Wan died (I expected these would be retconned to a holocron, but the recent Star Wars comics still have it as a journal). Between Obi-Wan and Yoda, Luke grew strong in his mastery of the force, sought and found a kyber crystal, built himself a new lightsaber, and, presumably, learned to dress as a Jedi. When we see him for the first time at Jabba’s palace, he is wearing what his training has taught him Jedi are supposed to wear, and his dress is accurate enough that both Bib Fortuna and Jabba recognize what he is, or at least what he’s pretending to be. 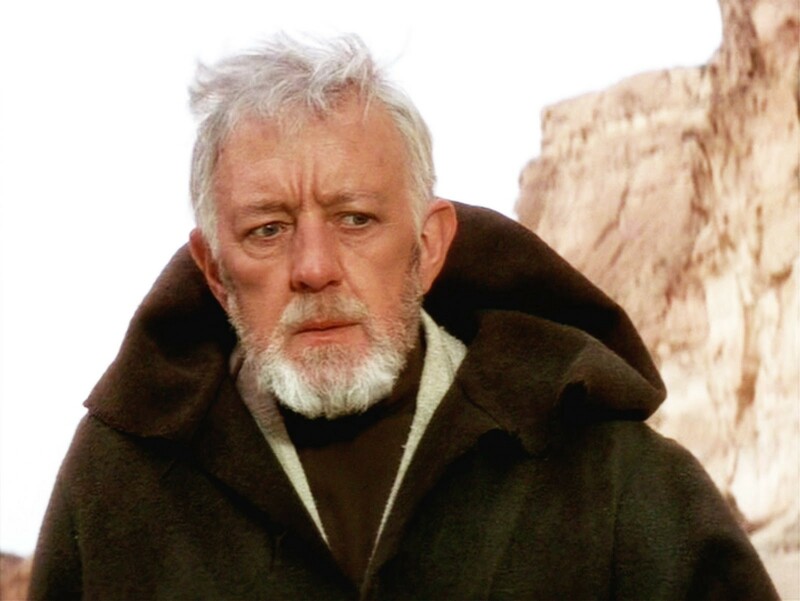 Ergo, my theory: Jedi didn’t dress like Obi-Wan in A New Hope. If Jedi had a standard uniform at all, they dressed like Luke in Return of the Jedi, and like Darth Vader in all three original films. This is why I always delight at seeing Jedi who do not wear the “traditional” costume that grew from Obi-Wan’s Tatooine disguise. I love Luke’s RotJ uniform. I love Ashoka Tano’s clothes (yes, I know she’s not technically a Jedi, but you could make the same argument against Luke). The Old Republic Jedi, as portrayed in many books, comics, and games, always delighted me in their variety of garb. Aayla Secura, Master Luminara, Barriss Offee, and Kanan are a handful of examples of Jedi who went their own way, costume-wise, during the Prequels/Original Trilogy era. My Accidental Jedi Robe Fiasco Theory is contradicted twice in the original trilogy. First, when we meet Yoda, he wears a ratty old tunic that looks a lot like the Tatooine garb worn by Obi-Wan, Owen Lars, and Luke in A New Hope. Of course, Yoda’s also in hiding from the Empire, presumably broke, and has gone a little senile, either from age or isolation; it could be that a burlap sack robe is the best he has available to him. It could also be that such clothes are accepted generic traveler garb throughout the poorer parts of the galaxy. As with Obi-Wan, because Yoda’s in hiding, it just doesn’t make sense he’d wear his Jedi robes, even if he is the only sentient being on Dagobah. The second contradiction is harder to explain away. At the end of RotJ, when Anakin’s Force ghost appears to Luke beside Obi-Wan and Yoda, he’s also wearing those Tatooine robes. I could put forward that Anakin is also from Tatooine, and he appears in Tatooine garb for that reason, but that’s a stretch. Rather, it seems to me that, for the first time in the series, the Star Wars art department consciously decided that Jedi wear the robes that allowed Obi-Wan to remain hidden on Tatooine, and not the uniform sported by Luke and Vader. Still, I think it’s a mistake, and one that Lucas and his art department doubled-down on when getting ready for The Phantom Menace. TPM was a place where Lucas and his team had an opportunity to reinforce the best of what had percolated in the larger Star Wars universe and fandom in the almost two decades after Jedi, and set right the mistakes of that era as well. Of course, as with the “improved” Original Trilogy re-release that preceded TPM, the Prequels mostly served to enhance the flaws in the marvelous world Lucas built (but that’s a different discussion), even while introducing some wonderful characters and ideas. There’s been a lot of fan retconning to explain the robes, including the idea that the Jedi originated on Tatooine, and thus the order adopted the flowing robes standard to that population. This seems a stretch, given that Tatooine is supposedly a backwater, but the existence of such theories reinforces my feeling that the standard Jedi robe decision was a mistake. Jedi Robes are an iconic part of the Star Wars universe. But an official uniform that has to be thrown to the ground before a fight (as happened so often in the Prequels) just seems silly, no matter how mysterious and dignified it makes you look. When Luke was finally revealed at the end of The Force Awakens, and was wearing more or less those traditional robes rather than some variation of his RotJ uniform, I’ll admit, along with elation at seeing Luke again and the sweeping beauty of that shot, I felt a small twinge of disappointment. Writer, actor, designer, d20 roller, maker of things. It’s too bad I won’t live. But, then again, who does?